Nanosilver « Global Market Insights, Inc. In the recent times, nanosilver market has been highly characterized by the increased convergence of path-breaking technologies which has subsequently culminated in robust demand from electrical and electronics, healthcare, food and beverages, textile, and water treatment industries. Prominent players across diverse business domains in the aforementioned sectors have been earnestly exhibiting their willingness to utilize nanosilver in their products, courtesy the countless number of applications and benefits of nanosilver. The most stimulating products to bolster the nanosilver industry landscape, have been emerging in the printing inks industry. To cite an instance, Sun Chemical, the world’s largest producer of printing inks and pigments, is set to launch its SunTronic range of products under its subsidiary, Sun Chemical Advanced Materials, in November this year. The highlight among these products is Sun Chemical’s nanosilver ink. Reportedly, with this nanosilver ink, it has now become viable to operate with a single nanosilver from the stage of a prototype to the finished product of leading inkjet systems in printed electronics. Such dynamic product innovations and consistent technical advancements coupled with the altering consumer preferences across the globe are bound to contribute to the rapid expansion of the nanosilver market. According to a report collated by Global Market Insights Inc., the nanosilver industry size stood at $1 Billion in 2016, out of which the electrical and electronics market portion seized around $350 Million. Nanosilver particles possess antimicrobial, antibacterial, antifungal, antiviral, and non-allergic properties. These unique characteristics of nanosilver particles have manifested into propelling the progression of nanosilver market. The product demand for antimicrobial coatings in consumer hygiene and medical applications has seen an upsurge in the recent past which will, in turn, boost the nanosilver market size in the near future. The major consumer hygiene applications include food packaging, personal care products, and clothing. The medical applications of nanosilver include dressings, bandages, creams, and tubings. The unprecedented applications of nanosilver are arriving on the horizon. A notable instance in case that can be cited is of, One Diamond Electronics, a U.S. based electronics enterprise, has unveiled a whole new range of antimicrobial coated, easy to wash keyboards, designed for utilizing with medical systems and industrial applications. Such ground-breaking applications of nanosilver are highly encouraging, as the medical electronics market and environmentally-regulated industrial applications continue to grow. Meanwhile, it is also prudent to take note of the challenges to be faced by nanosilver industry. The recent standards and laws formulated by the U.S. 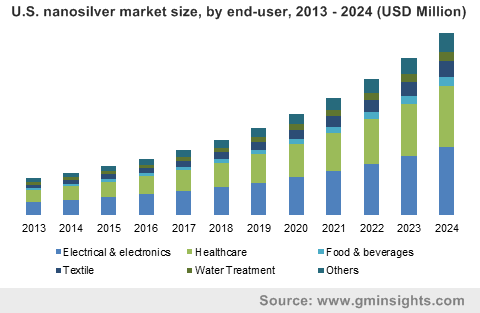 Environment Protection Agency and other regulatory authorities across the globe, against the harmful implications accrued out of product applications of nanosilver on human health and environment, may hinder the growth of nanosilver market size. Owing to the vast expanse of medical tourism landscape in Asia Pacific, especially in the countries such as India and other South-East Asian nations, the nanosilver products find wide-ranging applications in diagnosis, treatment, drug delivery, medical device coating, and for personal healthcare. All these aforementioned factors can be attributed to the estimated growth of APAC nanosilver market at 16% over 2017-2024. The North American nanosilver industry was estimated to be worth over $400 Million in 2016. This can be accredited to the swift technological headways complimented with robust demand for consumer devices including home appliances, entertainment products, telecom equipment, and computer peripherals. As the key players in nanosilver market persist to make concerted efforts towards investing, upgrading, and refining the product applications portfolio, the nanosilver market is hopeful to witness commendable growth in the coming years. The predominant nanosilver product manufacturers include NovaCentrix, Creative Technology Solutions Co. Ltd., Nano Silver Manufacturing Sdn Bhd, Advanced Nano Products Co. Ltd., Applied Nanotech Holdings, Inc., SILVIX Co. Ltd., and Bayer Material Science. The latest trend emerging in the nanosilver market is of upcoming players keenly engaging in forming significant alliances with the OEM partners, printhead manufacturers and system integrators in a vast range of verticals, including textile, décor, graphics, industrial packaging. The market further anticipates mergers and acquisitions, strategic collaborations that would improve its profitability and expand the customer base in a drastic way. According to a recent report compiled by Global Market Insights Inc., the nanosilver market is forecast to register a decent CAGR of 15.6% over 2017-2024. This entry was posted in Polymers and Advanced Materials and tagged Asia Pacific Nanosilver Market, Biological, Chemical Reduction, Europe Nanosilver Market, Nanosilver, Nanosilver Market, Nanosilver Market Analysis, Nanosilver Market Forecast, Nanosilver Market Growth, Nanosilver Market Outlook, Nanosilver Market PDF, Nanosilver Market Report, Nanosilver Market Share, Nanosilver Market Size, Nanosilver Market Statistics, Nanosilver Market Trends, North America Nanosilver Market, Physical.